creative savv: The Thanksgiving countdown: Easy as pie! The Thanksgiving countdown: Easy as pie! About a week before Thanksgiving, I begin some of the meal preparations. This year I'm having to begin one day early, due to scheduling. I make out my plan of attack, and every day tackle one or two items on my list. Yesterday, I baked one of the pumpkins and pureed it for pie, and made a batch of freezer pie dough (recipe here). Most of the time, I make this dough and freeze in patties for single crusts. 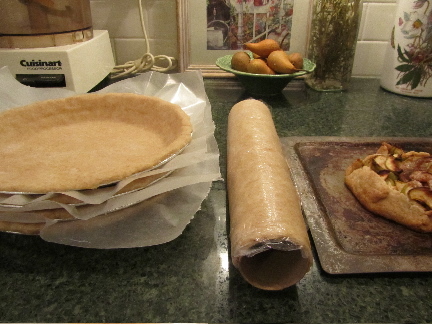 For Thanksgiving, I like to get the dough into a pie plate and get that step done, as well. While I was at it I decided to just roll all the dough. My recipe makes enough dough for 5 single crusts. I have a stack of aluminum pie pans, so used several of those. And for the last 1/5th of the dough, I rolled it to be a topper for a 2-crust pie, or for a deep dish turkey pot pie, some dinner in the future. After rolling this piece out, I placed it between two layers of plastic wrap and then rolled it around an empty paper towel tube. The pie crusts in the pie pans are separated by sheets of waxed paper. And all the dough is wrapped in a couple of layers of plastic grocery bags. All are now tucked in the freezer, ready to use. To use one unbaked pie crust, I'll thaw it on the kitchen counter for a few hours, then use as I would freshly mixed dough. In all, this took me about an hour (including putting the tart together), and provides several ready-made pie crust for easy pie making. I love this, Lili! It reminded me of a post that I read the other day at They Hand Hath Provided. She makes her pie crusts ahead and freezes them too. And it wasn't that much extra time, either. I was already mixing the dough, and rolling it out for 5 crusts wasn't much more work than 1. I already had made the huge flour-y mess in the kitchen with the one, so figured just do them all. Thanks for the link to Thy Hand Hath Provided. I see her site pop up on a number of other blogs. I'll check it out. Its the pie crust that I really hate doing for pies. So this just gets it done all one one day. And now my hungry brood can have pie again. They'd been asking for pie for a couple of months, but i just haven't wanted to bother with crusts. What a great idea, a pot pie sounds delicious, it's one of my favorites. Something so simple it brings back memories of my childhood. I love pot pies, too. I used to love those little ones that came in a tiny tin! Smart move! This year I'm not responsible for any of the desserts for our family get together. I've got the turkey, gravy, rolls, rice/mashed potatoes (we haven't decided) and everything else is being provided by the rest of the family. Mama will be making sweet potato pies and pecan pies. Lucky you! Well, actually you have a lot to do, it sounds like. I don't think I've ever had sweet potato pie. I imagine it's like pumpkin, but denser. That apple tart looks yummy! I considered eating it all by myself for lunch, and just not telling anyone about it! But sometimes it is nicer to share.